* co-first authors: These two authors contributed equally to this work and should be considered as co-first authors. Objectives: To provide insight into the biological effects of activated Yes-associated protein (YAP) on the proliferation, apoptosis, and senescence of human periodontal ligament stem cells (h-PDLSCs). Methods: h-PDLSCs were isolated by the limiting dilution method, and their surface markers were quantified by flow cytometry. Enhanced green fluorescence protein (EGFP)-labeled lentiviral vector was used to activate YAP in h-PDLSCs, then qRT-PCR and Western blotting were used to evaluate the expression level of YAP. Immunofluorescence was used to detect the location of YAP in h-PDLSCs. The proliferation activity was detected by cell counting kit-8 (CCK-8) and 5-ethynyl-2'-deoxyuridine (EdU), and the cell cycle was determined by flow cytometry. Apoptosis was analyzed by Annexin V-APC staining. Cell senescence was detected by β-galactosidase staining. Proteins in ERK, Bcl-2, and p53 signaling pathways were detected by Western blotting. Results: h-PDLSCs were isolated successfully and were positive for human mesenchymal stem cell surface markers. After YAP was activated by lentiviral vector, the mRNA and protein of YAP were highly expressed, and more YAP translocated into the nucleus. When YAP was overexpressed in h-PDLSCs, proliferation activity was improved; early and late apoptosis rates decreased (P<0.05); the proportion of cells in G2/M phases increased (P<0.05), while that in G0/G1 phase decreased (P<0.05); cellular senescence was delayed (P<0.01); the expression of P-MEK, P-ERK, P-P90RSK and P-Msk increased, while the expression of Bcl-2 family members (Bak, Bid and Bik) decreased. Conclusions: Activated YAP promotes proliferation, inhibits apoptosis, and delays senescence of h-PDLSCs. The Hippo-YAP signaling pathway can influence ERK and Bcl-2 signaling pathways. Periodontal ligament stem cells (PDLSCs) are mesenchymal stem cells that have the ability of self-renewal and multi-differentiation . Located in the periodontal ligament, PDLSCs take part in the regeneration and reconstruction of different periodontal tissues such as alveolar bone, periodontal ligament, and cementum . In recent years, PDLSCs have been regarded as seed cells in tissue engineering that have the potential to regenerate destroyed tissues and organs [3, 4]. Since the biological properties of seed cells such as proliferation, apoptosis, and senescence can directly affect regeneration, it is necessary to understand their regulation. Several different signaling pathways have been found that influence the biological behaviors of PDLSCs, though the exact mechanisms are still not clear [5-7]. The Hippo signaling pathway plays pleiotropic roles in the regulation of cellular behavior and organ size, and can affect both proliferation and apoptosis of cells [8-11]. The core of the Hippo signaling pathway consists of a kinase-dependent module and a transcriptional module . When the kinase module is “on”, the transcriptional module is inactive, and when it is “off”, the transcriptional module becomes active . The core components of the kinase module consist of the serine/threonine kinases 1, 2 (MST1, 2) and the large tumor suppressor 1, 2 (LATS1, 2) . The downstream kinases LATS1 and LATS2 directly phosphorylate the mediators of the transcriptional module, the co-transcriptional activator Yes-associated protein (YAP) and its paralog transcriptional coactivator with a PDZ-binding domain (TAZ), resulting in their inactivation . When the Hippo signaling pathway is inhibited, YAP/TAZ will translocate into the nucleus and interact with a transcription factor named transcriptional enhancer associate domain (TEAD). TEAD can activate some target genes that are related to cell proliferation, apoptosis, senescence, differentiation, etc. [16-18]. However, there are few studies on the expression of the Hippo/YAP pathway in human periodontal ligament stem cells (h-PDLSCs), and its exact function needs further exploration [19-21]. Therefore, the goal of the present study was to gain further insight into the expression and spatial distribution of YAP in h-PDLSCs, and to investigate the role of YAP in the regulation of proliferation, apoptosis, and senescence in h-PDLSCs. The h-PDLSCs were isolated and cultured according to previous studies . The study protocol was approved by the Medical Ethical Committee of the School of Stomatology, Shandong University (Protocol Number: GR201603), and written informed consent was obtained from each individual participant. All protocols were carried out in accordance with the approved guidelines. The premolars, which were extracted for orthodontic reasons from systemically healthy patients, were used for cell isolation. The age of the participants ranged from 12 to 16 years-old. The teeth were kept in α-MEM (Gibco, Grand Island, NY, USA) containing 400 U/ml penicillin and 400 mg/ml streptomycin (Gibco) on ice and transported to the laboratory as quickly as possible. After the teeth were washed in PBS containing 400 U/ml penicillin and 400 mg/ml streptomycin several times, the periodontal ligament tissues were scraped from the middle 1/3rd of the root surface and were minced into small pieces (1 mm × 1 mm × 1 mm) by an aseptic scalpel. The minced tissues were incubated with 3 mg/ml collagenase type I (Sigma) and 4 mg/ml dispase (Sigma) in α-MEM (Gibco) at 37°C for 1 h. Single cell in suspension was obtained by passing through a strainer (pore size: 70 μm; BD Falcon Labware). Then cells were seeded in 10-cm petri dishes containing α-MEM supplemented with 15% FBS (Gibco), 2 mM L-glutamine, 100 U/ml penicillin, and 100 mg/ml streptomycin, and incubated at 37°C in 5% CO2. Cells at passages 3-5 from one cell line were used for subsequent experiments. The immunophenotype of cells at passage 3 was analyzed by flow cytometry according to the manufacturer's instructions (BD Stemflow™ hMSC Analysis Kit, BD Bioscience, NJ, USA). The following antibodies were used: hMSC positive cocktail (CD90 FITC, CD105 PerCP-Cy5.5, CD73 APC, CD44 PE), hMSC negative cocktail (CD34 PE, CD11b PE, CD19 PE, CD45 PE, HLA-DR PE). Cells were incubated with respective antibodies and analyzed in a BD FACSCalibur flow cytometer (BD Biosciences). 1 × 105 cells were seeded in 6-well culture plates in osteogenic, adipogenic, and chondrogenic induction conditions for 4 weeks, then cells were detected by Alizarin Red staining, oil red O staining, and Alcian blue staining, respectively. Construction and production of overexpressed YAP (OE YAP) lentiviral vectors were prepared by Shanghai Genechem Company. h-PDLSCs at passage 3 were plated in 6-well plates at a density of 1 × 105 cells/well and cultured to 40% confluence, then cells were transfected with virus-containing supernatant supplemented with polybrene. After the transfection, cells were seeded in culture dishes to 30% confluence, then puromycin (Solarbio company) was added into the culture medium (4 μg/mL) for about 10 d. h-PDLSCs transfected with normal lentivirus were used as controls. The transfection efficiency of YAP was measured by Real-time quantitative reverse transcription polymerase chain reaction (qRT-PCR) and Western blotting. All experiments were performed in triplicate and repeated three times. 104 cells were plated on coverslips in 24-well plates and cultured for 24h. After washing in PBS, cells were fixed in 4% paraformaldehyde (PFA) for 30 min at room temperature. Then cells were incubated in 0.1% Triton X-100 for 10 min. After blocking in Blocking Buffer for 60 min, cells were incubated with primary YAP antibody (1:100, CST) diluted in blocking solution overnight at 4°C. Then cells were washed in PBS and incubated in fluorochrome-conjugated secondary antibody (1:500, CST) for 1 h at room temperature in the dark. Finally, cells were counterstained with DAPI (1 μg/ml, CST) for 5 min and observed under a fluorescence microscope. 1.5 × 105 cells were plated in 6-well plates and cultured for 24 h. 1 ml TRIZOl was added into the wells and total RNA was extracted from cells according to the manufacturer's protocol (Invitrogen). 1 μg total RNA was reverse transcribed to cDNA by a SuperScript™ II Reverse Transcriptase Kit (Invitrogen). qRT-PCR was carried out by a Roche Light Cycler®480 according to the manufacturer's protocol (Takara) with SYBR Green: one cycle of 95°C for 30 s, followed by 40 cycles of 95°C for 5 s and 60°C for 20 s. Relative gene expression was calculated using the 2-△△Ct method (△△Ct =(CT target-CT GAPDH)OEYAP-(CT target-CT GAPDH) control)OENC), normalizing with glyceraldehyde-3-phosphate dehydrogenase (GAPDH) levels. The primers used for qRT-PCR are listed in Table 1. 1.5 × 105 cells were plated in 6-well plates and cultured for 24 h. Total proteins were collected with RIPA buffer supplemented with protease inhibitors and phosphatase inhibitors. Protein concentration was determined by the BCA method using the chemiluminescence reader Image Quant LAS4000 (GE, USA). After being separated by SDS-PAGE, proteins were transferred to PVDF membranes and blocked with 5% milk solution. Then primary antibodies were used to incubate the membrane overnight at 4°C, followed by secondary antibody incubation for 1 h at room temperature. Protein bands were visualized with enhanced chemiluminescence (Millipore). Protein levels were normalized to the internal control GAPDH. Primary antibodies included YAP (1:1000, CST), P-Msk1 (1:1000, CST), P-ERK1/2 (1:1000, CST), ERK (1:1000, CST), P-MEK1/2 (1:1000, CST), P-P90RSK (1:1000, CST), cyclin B1 (1:1000, CST), CDK6 (1:1000, CST), P18 (1:1000, CST), P27 (1:1000, CST), caspase 3 (1:1000, CST), Bak (1:1000, CST), Bax (1:1000, CST), Bad (1:1000, CST), Bid (1:1000, CST), and Bik (1:1000, CST). The cell counting kit-8 (CCK8) proliferation assay was performed according to the manufacturer's instructions (Dojindo Laboratory). Briefly, 96-well plates were seeded with 1000 cells per well. Every 24 h, CCK8 reagent was added to the wells. After a 3-h incubation, plates were measured for spectrophotometric absorbance at 450 nm. The 5-ethynyl-2'-deoxyuridine (EdU) staining proliferation assay was performed according to the manufacturer's instructions (Ribobio). Briefly, 5 × 104 cells were seeded in 6-well plates. After 3 days, cells were incubated with 50 mM EdU labeling medium at 37°C for 2 h, followed by immobilization and staining with Apollo®567 solution and Hoechst33342 solution for 30 min at room temperature in the dark. All cells were observed under a fluorescence microscope. Cell cycle analysis was performed according to the standard method with some modifications. Briefly, 5 × 105 cells were fixed with 70% cold ethanol at -20°C overnight. The next day, fixed cells were centrifuged at 1200 g for 1 min and washed with PBS twice. After that, cells were resuspended with 200 µl RNase A (1 mg/ml) at 37°C for 10 min, followed by the addition of 300 µl propidium iodine (PI, 100 µl/ml) to stain the DNA of cells in the dark. After a 20-min incubation at room temperature, the DNA contents of cells were analyzed in a FAC Scan flow cytometer (Becton Dickinson, Franklin Lakes, NJ, USA) and the data was analyzed by Mod Fit LT V2.0 software (Becton Dickinson). Apoptosis was analyzed by an Annexin-V-APC staining kit (Sungene Biotech Co, Ltd.). 5 × 105 cells were collected and suspended in 500 μl of binding buffer. Then cells were incubated at room temperature in the dark for 10 min after labeling with 5 μl of Annexin V-fluorescein APC. Then cells were incubated with 5 μl 7-AAD solution for 5 min at room temperature in the dark. Finally, cells were analyzed in a BD FACSCalibur flow cytometer (BD Biosciences), and the data was analyzed by WinMDI V2.9 software (The Scripps Research Institute, San Diego, CA, USA). 104 cells were seeded in 24-well plates and cultured for 24 h. Then cells were washed in PBS and fixed in 4% paraformaldehyde for 20 min. After that, cells were stained in β-galactosidase solution at 37°C without carbon dioxide for 24 h. Cells were observed under a microscope and counted in 6 randomly selected high-power microscopic fields (×100) per filter. Culture and identification of h-PDLSCs. (A) Primary cells derived from human periodontal ligament tissue (scale bar: 50 μm). (B) The immunophenotypes of h-PDLSCs were analyzed by flow cytometry using hMSC positive markers (CD44, CD73, CD90, and CD105) and hMSC negative markers (CD11b, CD19, CD34, CD45, and HLA-DR). (C) Alizarin Red staining after osteogenic induction for 4 weeks (scale bar: 50 μm). (D) Oil red O staining after adipogenic induction for 4 weeks (scale bar: 50 μm). (E) Alcian blue staining after chondrogenic induction for 4 weeks (scale bar: 20 μm). All data are presented as the mean ± SD of at least three independent experiments. Data were analyzed by one-way analysis of variance or t test using SPSS software (SPSS 19.0). Differences were considered statistically significant when p<0.05. Cultured primary cells derived from human periodontal ligament tissue exhibited typical fibroblast-like morphology (Fig. 1A). Flow cytometric analyses showed that cells were positive for the human mesenchymal stem cell (hMSCs)-positive cocktail (CD73, CD90, CD105, CD44) and negative to the hMSCs negative cocktail (CD11b, CD19, CD34, CD45, HLA-DR) (Fig. 1B). For multipotent differentiation assays, mineralized nodules, lipid droplets, and cartilage were detected after induction (Fig. 1C-E). After transfection, the expression of YAP in h-PDLSCs was measured by qRT-PCR and Western blotting. There was a significant increase of YAP mRNA expression in the YAP overexpression group (OE YAP group) when compared with the control group (OE NC group) (P<0.001) (Fig. 2A). 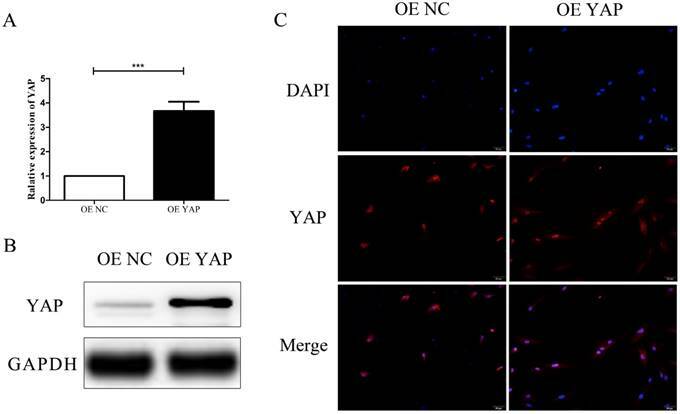 Western blotting results showed that YAP protein expression in the OE YAP group was significantly higher than that in the OE NC group (P<0.05) (Fig. 2B). These results demonstrated that YAP was overexpressed in the OE YAP group. In the immunofluorescence study, the merged images in Fig. 2C verified that YAP was located in both the cytoplasm and the nuclei of h-PDLSCs. However, the proportion of YAP located in the nucleus was higher in OE YAP cells than that in OE NC cells (Fig. 2C). These results demonstrated that more YAP was active and translocated into nucleus in the OE YAP group. The results of CCK-8 showed that the proliferation activity of h-PDLSCs increased gradually as time went on. After day 2, the cell proliferation activity in OE YAP group was higher than that in OE NC group significantly (P<0.05 or 0.001) (Fig. 3B). In EdU testing, nuclei of all cells were stained with blue and nuclei of cells with high DNA replication activities (EdU-positive cells) were stained with red at the same time. The proportion of EdU-positive cells (purple nucleus in merged images of Figure 3A) in all cells was higher in the OE YAP group than OE NC group (Fig. 3A), indicating that YAP overexpression increased the proliferative activity of h-PDLSCs. Overexpression efficiency and localization of YAP. (A) Levels of YAP mRNA were examined by qRT-PCR with GAPDH as a control. (***P<0.001). (B) Levels of YAP protein were examined by Western blotting with GAPDH as a control. (C) Localization of YAP was detected by immunofluorescence staining with blue DAPI nuclear counterstain (scale bar: 50 μm). Overexpression of YAP prompted the proliferation of h-PDLSCs. (A) Cell proliferation was measured by EdU staining. The nucleus of EdU positive cells were red, and nucleus of all cells were stained with Hoechst blue. The number of stained cells was count under fluorescence microscope, and the percentages of proliferating cells were determined as EdU-positive cells/all cells. Data were means ± standard deviation (**P<0.01) (scale bar 100 μm). (B) Cell proliferation was measured by CCK-8. (*P<0.05, ***P<0.001) (C) Levels of P-Msk1, ERK, P-ERK1/2, P-MEK1/2, and P-P90RSK were examined by Western blotting with GAPDH as a control. Proteins in the ERK signaling pathway were detected by Western blotting. The expression of P-Msk1, which can phosphorylate ERK, increased when YAP was overexpressed. At the same time, the protein levels of P-ERK1/2 and its target proteins P-P90RSK and P-Msk1 increased in the OE YAP group (Fig. 3C). These results indicated that the ERK signaling pathway was up-regulated when YAP was overexpressed. Overexpression of YAP accelerated the cell cycle progression. (A) The distribution of the cell cycle (G0/G1, S, G2/M) was detected by flow-cytometry. Data were means ± standard deviation (*P<0.05). (B) Levels of cyclin B1, CDK6, P18, and P27 were detected by Western blotting with GAPDH as a control. Flow-cytometry analysis results showed that the distribution of the cell cycle changed when YAP was overexpressed. Compared with the OE NC group, the proportion of cells in G0/G1 phase decreased (P <0.05), while that in G2/M phase increased (P <0.05) in the OE YAP group (Fig. 4A). 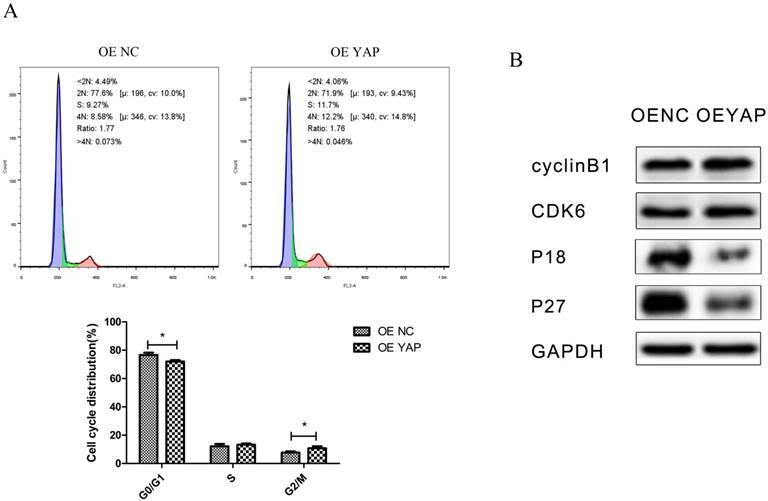 In Western blotting, cyclin-dependent kinase 6 (CDK6) and cyclin B1 were upregulated, while CDK inhibitors P18 and P27 were downregulated when YAP was overexpressed (Fig. 4B). Since CDK6 is responsible for G1/S phase transition and cyclin B1 is responsible for G2/M phase transition, this demonstrated that YAP promoted cell mitosis. The percentages of cells demonstrating early apoptosis in the OE NC and OE YAP groups were 9.38 ± 0.62% and 6.55 ± 0.18% respectively, and the early apoptosis rate was lower when YAP was overexpressed (p<0.05). The late apoptosis rate in the OE YAP group was also significantly lower than that in the OE NC group (P<0.001) (Fig. 5A). The protein levels of caspase 3 and Bcl-2 family members (Bak, Bax, Bad, Bid, and Bik), which are related to cell apoptosis, were detected by Western blotting. 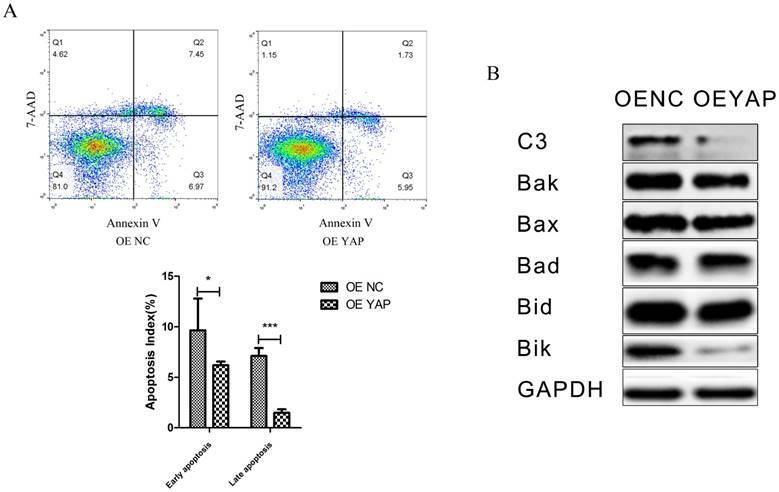 The results showed that caspase 3 (C3), Bak, Bid and Bik decreased after YAP was overexpressed (Fig. 5B). These results indicate that overexpression of YAP inhibited the apoptosis of h-PDLSCs. Cells positive for β-galactosidase have the potential for senescence. Staining results showed that the OE YAP group had a lower senescence rate than the OE NC group (P<0.01) (Fig. 6A, B), which indicates that activated YAP postponed the senescence of h-PDLSCs. Many studies have recently revealed a significant contribution of the Hippo pathway to cellular phenomena such as proliferation, apoptosis, differentiation, senescence, and cancer development [24-26]. As a key downstream effector of the Hippo pathway, YAP is involved in the regulation of some kinds of stem cells, but the exact mechanism is not clear [17, 18, 27]. H-PDLSCs are research hotspots in tissue engineering, and our study on the role of YAP in the regulation of the biological behaviors of h-PDLSCs can provide new insight into tissue regeneration. Overexpression of YAP inhibited the apoptosis of h-PDLSCs. (A) Apoptosis was detected by flow-cytometry. Data were means ± standard deviation (*P<0.05, ***P<0.001). (B) Levels of caspase 3(C3), Bak, Bax, Bad, Bid, and Bik were detected by Western blotting with GAPDH as a control. We demonstrated that YAP was overexpressed successfully by lentiviral vectors, and increased amounts of activated YAP transferred into the nucleus to activate downstream genes. Thus, lentivirus transfection was a useful and effective way to overexpress YAP. The number of cells increased, more cells engaged in DNA replication and more cells were in G2/M phase when YAP was overexpressed in h-PDLSCs. This indicates that YAP can regulate the cell cycle in h-PDLSCs, and that activation of YAP accelerates the cell cycle. Several previous studies have proven that the Hippo pathway can regulate the proliferation of different kinds of stem cells [20, 28, 29]. For example, knockdown of YAP inhibits the proliferation of embryonic neural stem cells , activation of YAP-TEAD leads to the expansion of neural progenitor cells in a chicken neural tube model , and orthodontic strain affects the Hippo-pathway effector YAP concomitant with proliferation in human periodontal ligament fibroblasts . The present study is consistent with these studies, and YAP was shown to be a good target for the proliferation of h-PDLSCs. Hypothetical model for the regulation of YAP on proliferation and apoptosis in h-PDLSCs. 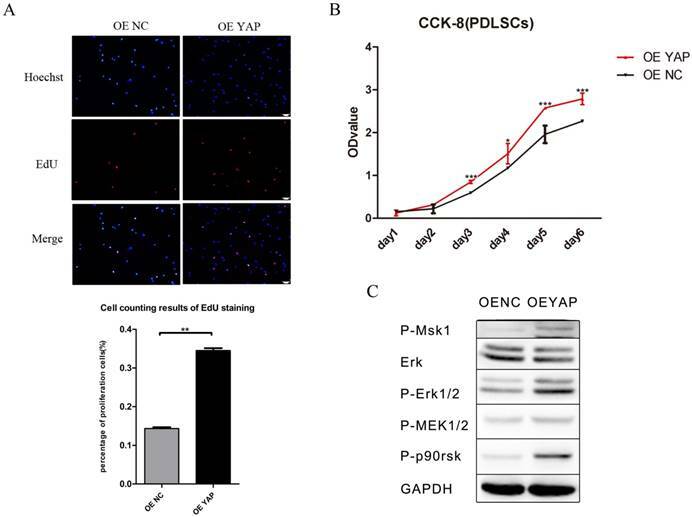 In the present study, CDKs responsible for G1/S and G2/M phase transition were upregulated, and CDK inhibitors were downregulated in OE YAP cells, which suggests that CDK6, cyclin B1, P18, and P27 take part in direct or indirect regulation by YAP in h-PDLSCs. Several studies have shown that YAP regulates cell growth by regulating cyclins, CDKs, or CDK inhibitors [30, 31], but the exact mechanism need further study. Our Western blotting results showed that the ERK signaling pathway, which regulates the proliferation of stem cells [32, 33], was activated when YAP was overexpressed. Some previous studies have also indicated a relationship between the ERK and Hippo signaling pathways [34-36], and crosstalk between ERK and YAP has the potential to regulate cell functions. We found that the YAP affected the ERK signaling pathway in h-PDLSCs, though the molecular mechanism needs further study. Apoptosis is important in cells, and our experiments showed that both the early and late cell apoptosis rates of h-PDLSCs were reduced when YAP was overexpressed. These results indicate a relationship between the Hippo pathway and cell apoptosis, and are consistent with previous studies [37-40]. For example, in mouse mammary epithelial cells, overexpression of YAP suppresses TGF-β1-induced apoptosis, while knockdown of YAP induces apoptosis ; in human renal carcinoma cells, curcumin enhances temsirolimus-induced apoptosis through upregulation of YAP/p53 ; in human pulmonary micro-vascular endothelial cells, lipopolysaccharide induces apoptosis via the YAP signaling pathway ; and promyelocytic leukemia protein enhances apoptosis of gastric cancer cells through YAP . Notably, the expression levels of caspase 3 and Bcl-2 family members (Bak, Bid, and Bik) decreased when YAP was overexpressed, suggesting that the Hippo pathway affects the Bcl-2 family to regulate apoptosis in h-PDLSCs. Senescence is also important in stem cells because it affects regeneration in tissue engineering. Xie's study found that silencing YAP inhibits cell proliferation and induces premature senescence , and Jin and his colleagues proved that inhibition of YAP contributes to the senescence of hepatic stellate cells induced by tetramethylpyrazine . In the present research, the senescence of h-PDLSCs was delayed when YAP was overexpressed, suggesting that YAP partly regulates senescence in h-PDLSCs. Since the mechanism of stem cell senescence is quite complex, more studies are needed to explore the relationship between the Hippo pathway and senescence. 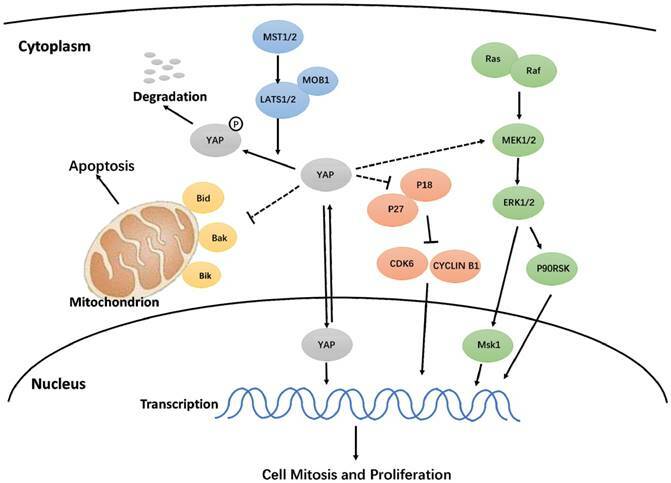 In this study, we discovered that activated YAP promotes proliferation, accelerates the cell cycle, inhibits apoptosis, and delays senescence in h-PDLSCs. Additionally, the Hippo-YAP signaling pathway affected the ERK and Bcl-2 signaling pathways, though the exact mechanism needs further study (Fig. 7). These results contribute to our understanding of YAP in h-PDLSCs and provide a theoretical foundation for the regulation of stem cells during tissue regeneration. This work was supported by grants from the National Natural Science Foundation of China (Grant No. 81300885 and 81402150), Shandong Provincial key research and development program (Grant No. 2017GSF18117, 2016GSF201115 and 2015GSF118183), Shandong Provincial Natural Science Foundation (Grant No. ZR2018MH018), China Postdoctoral Science Foundation (Grant No: 2017M610432) Young Scholars Program of Shandong University (Grant No. 2015WLJH53) and the Construction Engineering Special Fund of Taishan Scholars (Grant No. ts201511106). We would like to thank LetPub (www.letpub.com) for providing linguistic assistance during the preparation of this manuscript.